Health On the Net (HON): Looking for reliable health information ? Looking for reliable health information ? You are among the millions of people around the world searching for health information online. Thousands of websites are attempting to meet this need. However, as you probably know, website reliability is not universal, nor do all sites provide quality information. 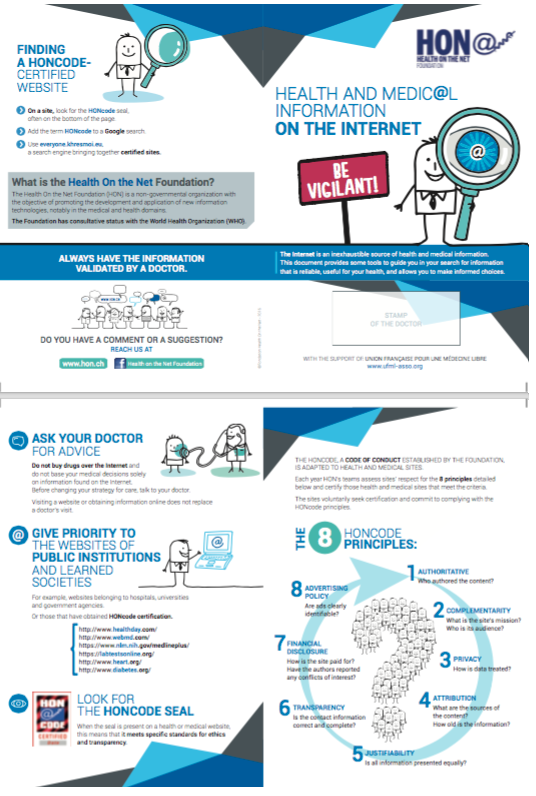 With the support of the French union for unrestricted healthcare (UFML - Union Française pour une Médecine Libre) and the association of doctors of the Canton of Geneva (AMG - Association des Médecins du canton de Genève), HON has drafted a simple educational pamphlet to encourage vigilance and provide guidance in determining the reliability of medical information on the Internet. This pamphlet will be available in doctors' waiting rooms and on the Internet.